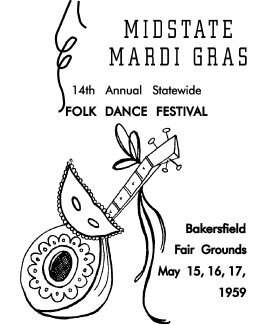 For our 14th Annual Statewide, Bakersfield spoke up loud and clear with their "Midstate Mardi Gras" Folk Dance Festival, may 15, 16, and 17, 1959. Headquarters hotel was the Hacienda and if memory serves me, it was a rambling group of buildings, located on the outskirts of Bakersfield. According to the schedule of events, registration started in the lobby of the Hacienda, Friday Evening. 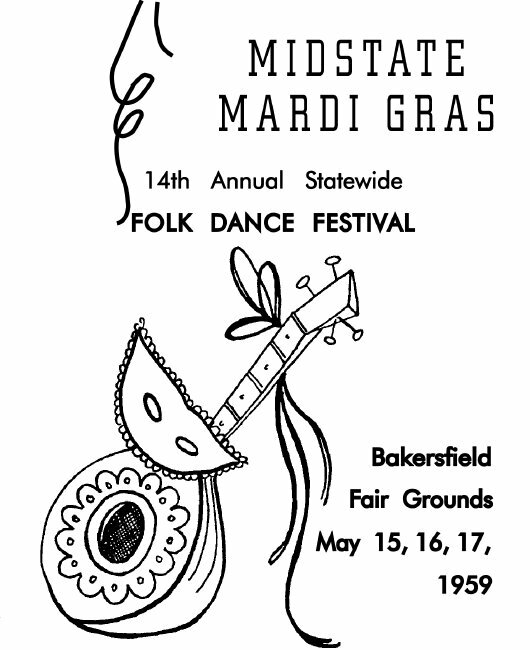 Later the activities moved out to the Fairgrounds for both a Square Dance Festival and a Folk Dance Festival, along with an hour and a half of exhibitions. At the After Parties from 11:30 p.m. until 2:00 a.m, general folk dancing was scheduled in the Fiesta Room of the Hacienda and Kolo Dancing in the Pinto Room. Later we enjoyed a buffet dinner in the Lanai Room. That took care of Friday. Saturday morning started with a Round Dance Institute, conducted by Frank Hamilton, 9:30 a.m. to 12:00 noon, and then a Folk Dance Institute, 1:00 p.m. until 5:00 p.m., both to be held in the Fiesta Room. The teachers, presiding at the Folk Institute were Madelynne Green, Millie von Konsky, Mona Lisa of England (no kidding), Al Pill, and Chris Tasulis. In the evening, starting at 8:00 p.m., there was an hour and a half of Exhibition Program at the Fairgrounds and then general dancing. After hours folk and kolo dancing was again held at the Hacienda with an added Round Dance party at Druid's Hall. It was Saturday night, as I recall, that the weather being warm, we wandered about the spacious grounds for a short time following the After Party at which time some of the more adventurous decided on a cooling swim in the large Hacienda pool. The only trouble, they disturbed some of the sleeping guests and were quickly ousted from the pool. Following the Sunday morning Evaluation Breakfast in the Fiesta Room where the price, by the way, was just $1.75, and where officers of both Federations, including President John Mooney of the North and Valerie Staigh of the South were introduced, we quickly returned to the Fairgrounds for the afternoon Festival and Costume Parade, under the direction of Millie von Konsky. Great credit is due Chairpersons Wilma Linscott and Millie Stephens for Square Dancing, and Louis Leonard and Helen Armiger for Round Dancing, along with their Committees, for such a fine Festival, and confidentailly, we deserved to be kicked out of the pool at 2:00 in the morning!